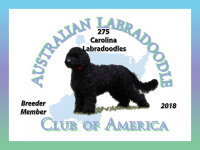 The Guardian Home program is a wonderful opportunity for a family to get a top quality Australian Labradoodle for a fraction of the price. Most importantly, the guardian program allows our breeder dogs to have a loving family and lead the life of a beloved pet, as they should. When a litter is born, Carolina Labradoodles may choose an exceptional puppy to keep and use as a breeding dog. A family who chooses to be a guardian home would take the puppy at 8 weeks and raise it as their family pet. A guardian family is expected to provide for the dog's health needs (routine vet visits, etc.) and guarantee proper socialization. The guardian family is expected to feed the dog a high quality dog food (approved by Carolina Labradoodles), have a fenced yard, keep him/her properly groomed, and prioritize the dogs exercise and social needs. We prefer our guardian families to be able to be home at least half of the day (ex. work part-time, or be retired). This program is highly beneficial for both the families and the dogs. If you are interested or want to know more about becoming a guardian home, please email me.